Tony Leonard photo of Secretariat arriving at Claiborne Farm following his retirement from racing. A special exhibition highlighting the photographic career of Tony Leonard will opened on Friday, July 21 at the National Museum of Racing and Hall of Fame. 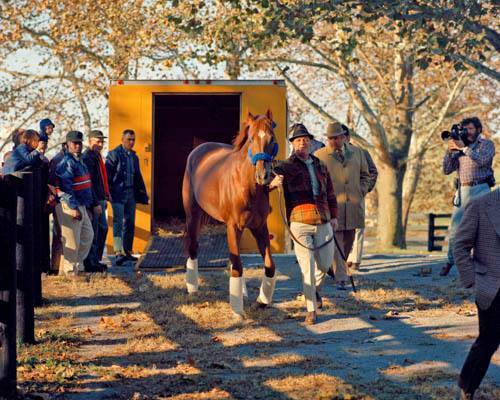 Entitled Racing’s Greatest and America’s Oldest: Selections from the Tony Leonard Collection, the exhibition highlights the thoroughbred racing photography of Tony Leonard with a focus on portraits of Hall of Fame members and Saratoga scenes. The exhibit will be featured in the Museum’s Peter McBean Gallery. Hall of Fame members featured in the exhibition include Pat Day, Chris McCarron, Chris Antley, Jorge Velasquez, Secretariat, Seattle Slew, Affirmed, Alydar, Bold ‘n Determined, Easy Goer and La Prevoyante, among others. Born Leonard Anthony Bergantino on Aug. 8, 1922 in Cincinnati, Ohio, Leonard served in the Army during World War II and became a professional entertainer after the war, singing in nightclubs across the country and eventually on Broadway. He took up the stage name of Tony Leonard at the suggestion of Bob Hope’s manager and came to Kentucky in 1961 with his wife, Adelle, to perform at the old La Flame nightclub on Winchester Rd. in Lexington. Settling in Kentucky, Leonard began taking photos of horses in the area as a hobby that soon turned into his full-time profession. He first made his name in racing when he went to Darby Dan Farm in Lexington and photographed the great stallion Ribot in his paddock. Several of the photos appeared as part of a feature in the Morning Telegraph and Leonard was on his way to a career as a thoroughbred photographer. International Photographic Council Lifetime Achievement Award by the United Nations in 2004. In 1994, his photograph of the field rounding the turn at Keeneland Race Course during a spring snowstorm earned him a coveted Eclipse Award. Following Leonard’s death in 2012 at the age of 89, his complete collection of prints and negatives was acquired by two thoroughbred industry veterans and one businessman, who have satisfied Leonard’s wish that his lifetime work be maintained and kept together in a single collection. John Adger, Bobby Shiflet, and David Sorrell purchased Leonard’s works in a deal that was approved by the court overseeing the conservatorship of Leonard’s assets. Prior to being on display at the Museum, selections from the Tony Leonard Collection were featured at the Headley-Whitney Museum of Art in Lexington, Ky., during 2016 in an exhibit titled: Through the Lens of Tony Leonard: 50 years of photography.